We are huge fans of ocean and sea life animals at our house. We love crafting them and learning about them! 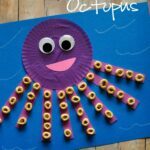 Our collaborative preschool theme this week is all about the ocean and I’m excited to share the Octopus Kid Craft my preschooler made with you. 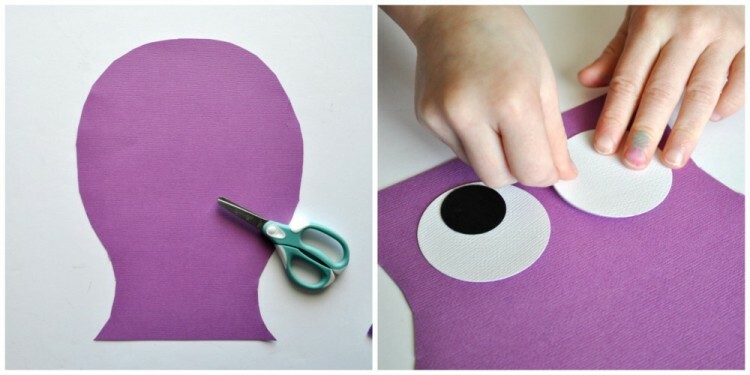 Not only is it simple to make, but it incorporates fine motor skills and using scissors so it’s a perfect preschool activity. 1. 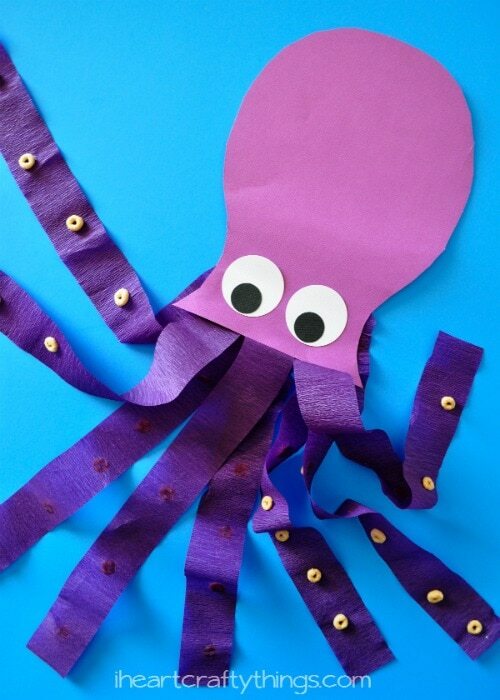 Draw the shape of an Octopus head onto your colored cardstock paper with your pencil and let your preschooler cut it out. You can see the shape I drew out for my daughter below. We have made an Octopus craft using a circle for a head, but I wanted ours to be more realistic this time, so I tried to draw the shape more reminiscent of an actual Octopus. 2. Have your preschooler use your circle punches to punch out two 2-inch white circles and two 1-inch black circles. Glue them onto the Octopus. 3. 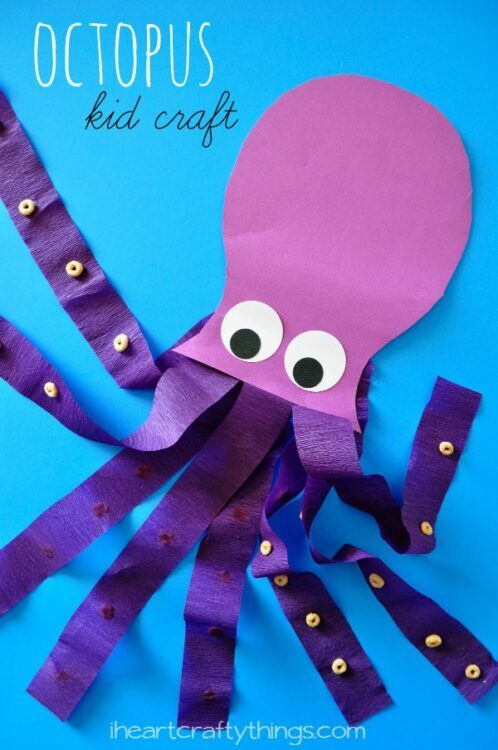 Turn your Octopus over and add a line of glue across the bottom of your Octopus. Add four of your streamer pieces along the glue. 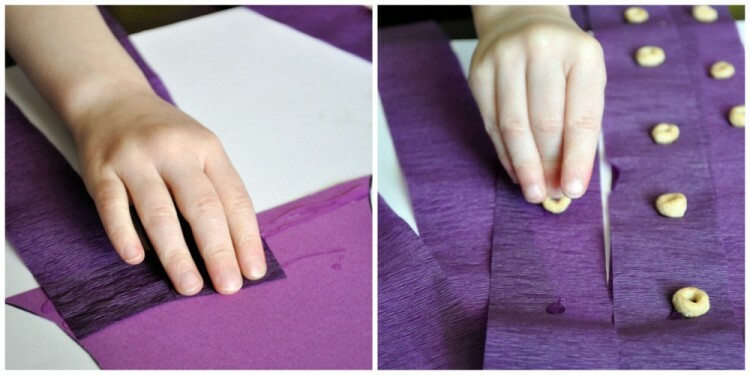 Make another layer of glue and add your other four streamer pieces. 4. 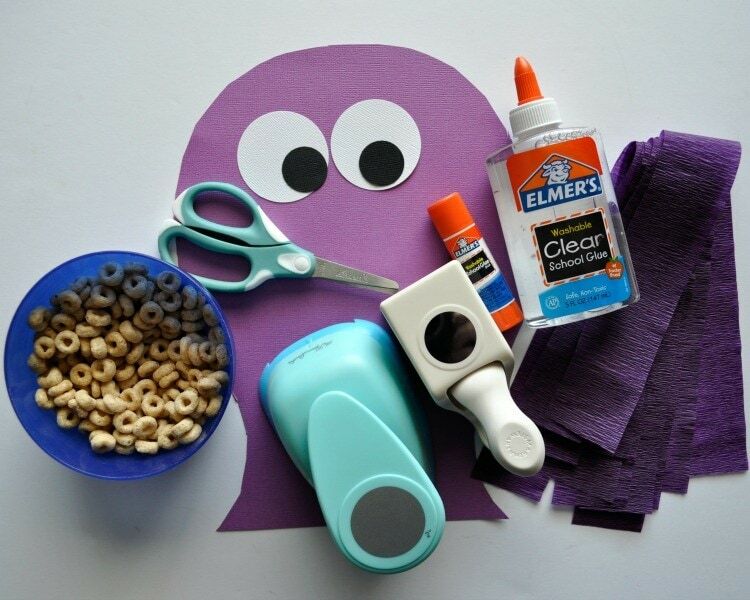 Put dots of glue along the back of the Octopus legs and place Cheerios onto the glue. The Cheerios resemble the Octopus suckers. 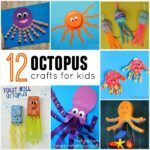 Let the glue dry completely and then you can pick up your Octopus and twirl him around and watch all of legs wiggle around. 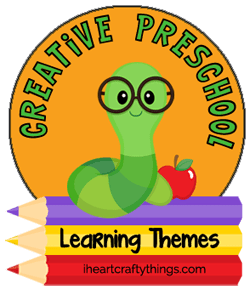 This post is part of a collaborative preschool series where four bloggers and myself have joined together to bring you fun crafts and activities based on a common preschool learning theme. This week we are sharing ideas focused on the Ocean. Stop by March 20, 2015 for Map/Geography Activities. This is such an adorable octopus and the Cheerios are a great touch! 🙂 The cheerios suckers are so cool and I love how it looks like the legs are moving! Super cute and fun! 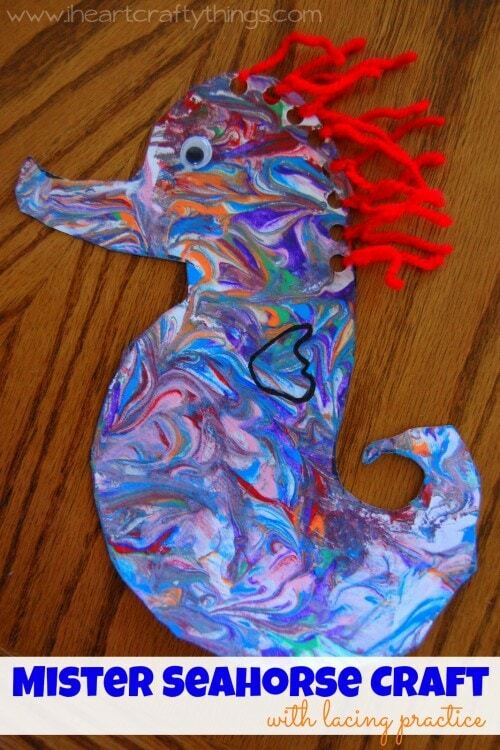 This is so cute- pinning for when we do our Ocean theme week! 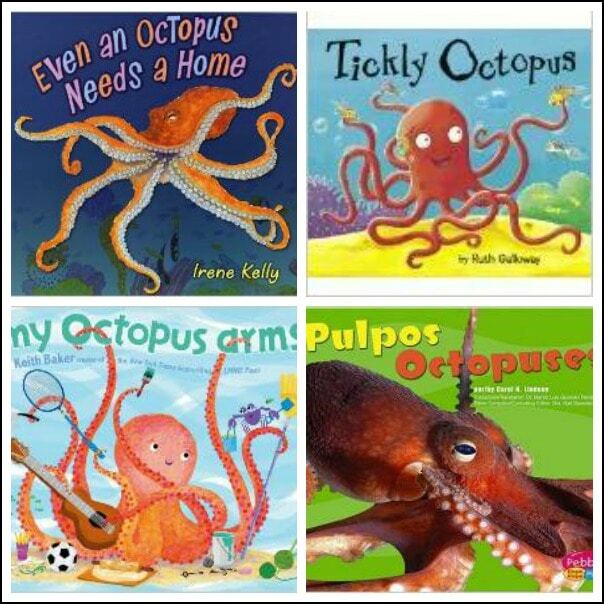 I absolutely love the purple octopus! 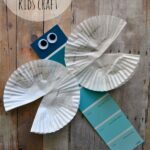 Thx for linking up your crafty ideas at the Thoughtful Spot!